My daughter is an avid One Direction fan so with her birthday coming up I decided to surprise her by making a 1D birthday cake. Let me show you how I managed to create a really easy birthday cake that made my little One Direction fan squeal with delight. I've also got pictures of other One Direction birthday cakes to give you more ideas depending on your skill level at cake decorating, trust me I'm no baker so if I can make a 1D cake then you can too! Use a Cake Topper To Create Your One Direction Birthday Cake! 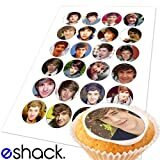 I actually saw some great 1D edible cake toppers on ebay and decided that I would use one of these for my daughter's birthday cake this year. I've never actually used one of these cake toppers before, but I thought it would be good for two reasons - it would look good and it would be an easy option for decorating the cake. Now that I had the cake topper I had to decide on how I was going to decorate the cake. By the way, I just brought an un-iced sponge cake at the supermarket - I'm into making the cake look good, not worrying about if it's edible! The advice I found online was to go for frosting or royal icing instead of fondant, as my daughter's not a great fan of royal icing I went with a vanilla frosting. In all honesty though I think fondant would've worked fine. Quick Note - always take note of the size of the edible topper you buy and the size of the cake you're making/buying - the cake should always be bigger than the topper and not the other way around! This is how mine turned out (I had to cut the topper a little bit to fit), all of my plans went out the window when I found the sizing was way off. What was supposed to be the easiest birthday cake I ever made for my daughter caused me a sleepless night thinking she would hate it. She loved it! Let's face it the boys were all on the cake even if it wasn't how I had envisioned it. The majority of her friends loved it too, the minority are the ones who can't understand the appeal of 1D. These could be incorporated really well with a 'big' edible topper. Simply pop your main edible topper on the top of the birthday cake and then add 5 cupcake toppers around the sides of the birthday cake (one of each member of 1D). The remaining cupcake toppers can be used on cupcakes at a One Direction party. Using fondant is great for creating designs on cakes that are going to be lying flat ie the official 1D symbol. Both of the cakes to the side have used the 1D symbol as the main focal point of their One Direction cake and I think they're both pretty funky, don't you? If you're not confident that you can do the 1D symbol freehand then simply do a search for official 1D symbol on google and print it out to make your own stencil. I was actually thinking about scanning one of my daughter's posters into my computer as a couple has the 1D symbol on it and I could've created a stencil from that. What you do once you have the 1D fondant symbol is up to you, the zebra print cake would've been a hit with my daughter whereas the pink one would've suited one of her friends really well. Another idea is to also add the boy's signatures to the cake - how? Well it just so happens that ChoppA from CakesByChoppA has the answer to that along with another idea for creating a cool One Direction cake. 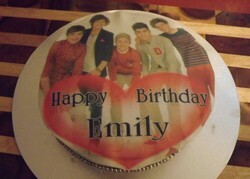 Creating a One Direction Birthday Cake That's Not a Flat Design! If you're a really good artist then consider creating your own version of One Direction to sit on top of a cake. The 1D birthday cake opposite looks great and if you're good at making things with clay then consider getting some gum paste and making edible cake toppers of all of the boys. Gum paste is similar to fondant, but can hold 3 dimensional shapes when dry which is why it's ideal for cake modeling. If you do decide to do this then make sure you allow plenty of time for them to dry - at least 24 hours. Using posters and stars and hearts on picks (these are available at a number of stores) are a great way of making your own 1D cake - I love the 1D symbol made up of black and white images of One Direction. Incorporating other cake decorating ideas with these is great whether it's silver cabouchons on the cake, edible multi-colored heart cake decorations or fondant designs, they all help to bring your One Direction Cake to life. My favorite addition has to be the fondant hearts on the side of Saleena's birthday cake with the names of all of the band members. Another way of incorporating some shape and making your 1D cake stand out is by adding dolls. Yes, I said adding dolls - you can get dolls of all of the boys of One Direction along with mini bobbleheads as well. Now I don't think a cake would be able to hold the entire band of dolls on top of it without one or more of them sinking into it, but here's some ideas. If your little (or not so little) Directioner has a favorite band member then simply add him on top of the cake along with the 1D sign for a cool looking cake. Take a leaf out of the guys from Ace of Cakes and use what my daughter calls a pretend cake on the bottom with dolls on it and then a 'real' cake as a second tier decorated with either a personalized edible topper, 1D fondant topper or some other idea you've found here. By a 'pretend cake' I mean one of the styrofoam dummy cakes that you can buy in a range of shapes that you simply ice. They can take more weight and you can add a real cake on top of them for eating. It's not just about cake you know! British boy band One Direction have left broken hearts around the world after their tour and everywhere you look it seems like One Direction t-shirts are rampant! There are some fantastic One Direction posters available and more than a few of them have ended up on my dd's wall so if you're looking for some 1D posters yourself let me show you the one's I've found. More Birthday Cake Ideas for When You Want a Change from 1D! Find a selection of cool birthday cake ideas here from Moshi Monsters to Angry Birds, Skylanders to Justin Bieber there's lots of ideas for the best birthday cakes ever! Love some of these non flat designs. Fun idea for a birthday cake that's easy, too.